Note from Kayarchy: The following was generously contributed by Auckland-based Rebecca Heap to Grant Glazer's "Hints & Tips" pages. I haven't tried out the design, but it looks good. Since the Hints & Tips pages seem to be defunct, I've reproduced the diagram and instructions here. She offered the plans and concept as "Public Domain" so anybody could make one for personal use, but she retains the copyright on any commercial production. Paddling in the City of Sails has the major advantage that on virtually every tip there will be some wind. 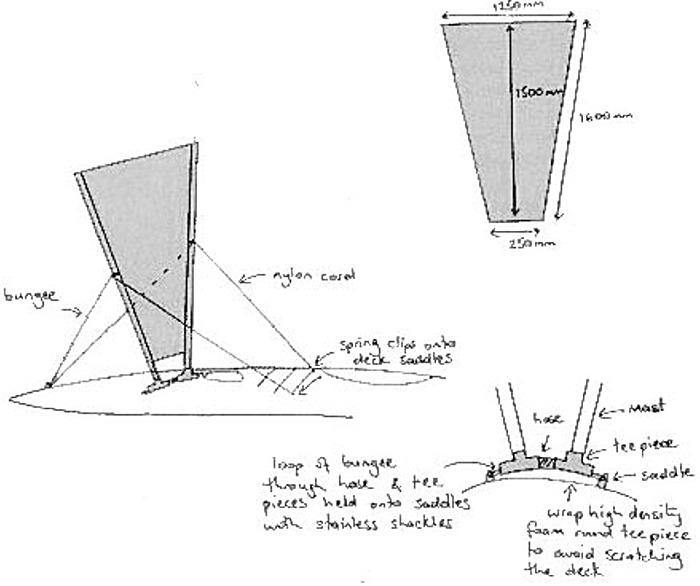 In 1995 I decided to make the most of that wind and designed the following sail. It has proven to be very popular and successful as it is safe as well as cheap and easy to make. Guaranteed to make your kayak go like a rocket downwind up to 40 degrees either side! There are two techniques - either sewing as given below or use seamstick which is a 3M product used by sail makers. It is like double sided sticky tape and you won't need to do any sewing at all. Draw the sail pattern into the ripstop nylon using the dimensions shown and cut it out. Using the off cuts make up two strips 12cm wide and about 1.7m long for the mast pockets. Fold over a 1cm hem on top and bottom of sail, pin and sew. Hem the ends of the mast pockets then fold mast pockets in half lengthwise and pin down each side of sail. Sew allowing a 1cm seam. Reinforce the tops of the pockets if desired to reduce wear. Sew across tops. Half way down mast pockets, cut a hole 8cm long and 4cm wide to allow guy lines to be tied to the mast. To make velcro sail tie, overlap 2cm of the fuzzy side with 2cm of the hooky side to make a long strip. Place a 20cm length of cord across the join between the two pieces and sew together. The cord is used to hol the tie to a convenient saddle. Cut a 5mm ring off the end of each mast and cut across to make a split ring. Glue these with pipe cement or Uhu to the masts about 2cm up from where the bottom of the hole in the mast pocket is positioned. They will stop the guy lines sliding down. Find some bamboo canes about 1.2m long that are a tight fit inside the pipe (the split rings are a good thing to take to the garden center to use to test the diameter!). These reduce the amount of flex in the pipe - dowel or other ridged material will also work. Glue or tape end caps on. Insert masts into pockets on sail. Fibreglass and Kevlar boats will require the addition of two saddles 25cm apart just forward of the front hatch. Puffins have these saddles already, and plastics like the Penquin and Squall can have the footing tied around the mouldings where the deck lines go. Make the foot as shown in the diagram. It is essential that the hose betweeen the tee pieces forms a tight fit so that the foot is not sloppy. Wrap with high density foam to avoid scratching the deck. You may need to build up the foam if you have a flat decked boat like a Spectrum or one with a steep pitch like the Squall so that the sail opens nicely - try first and see. Using the 6 or 8mm bungee loop it either round a saddle or deck moulding (or shackles) then through the hose and tie off round the other saddle or deck mounting. You will need to pull it up very tight. The footing is usually left permanently on the deck and the masts inserted when needed. Place the masts into the footings and get a friend to hold the sail perpendicular to the deck. Tie a length of bungee onto one side above the split ring, add the 20mm brass dog clip and clip it on to the carry handle. Tie the other end of the bungee to the mast on the other side. The bungee should be firm but not stretched. Do similar with the nylon cord looping it twice through each of the 12mm brass dog clips as this acts like a locking knot so the angle of the sail can be adjusted. Pull the nylon guy lines towards you to lower the sail and secure using the Velcro tie which should be attached to a saddle near the cockpit. To release the sail, undo the velcro and the bungee will automatically pull the sail up into position. Adjust the lines to catch maximum wind. Althougth this is a very safe sail in that the bungee footing gives way in a strong side gust before you get tossed out, I recommend carrying a good paddlers knife just in case you need to cut the guy lines for any reason. However, the good news is that there are about 60 of these sails in use in Auckland and there have never been any near misses or nasty accidents.